There are many reasons why people choose to purchase a zero-turn mower over a standard walk behind mower or riding mower. One of those reasons is the number and variety of mower accessories that can be added. From accessories to make you feel more comfortable to accessories to make your job a little easier, Spartan Mowers has an accessory just for you. Check out the 5 accessories that we think you should add to your Spartan Mower to make your 2018 mowing season run a little smoother. When mowing long, thick, or moist grass, you may want to discharge it to the side of the mower. This will help keep grass from clogging the blades and keep moist grass from accumulating under your deck or clumping in your yard. By adding the Spartan Shield to your mower, you are able to control the amount of discharge from the chute with the touch of a button. Not only can you control the amount of clippings, but this particular accessory also increases safety while decreasing the liability of a discharged object such as a rock or limb that you didn’t see prior to mowing. Whether you are in the lawn care business or you just have a lot of acreage to maintain, there is no doubt that you have felt the after effects of riding on a mower. Constant vibrations like those felt in the arms as you steer through trees and other obstacles can leave you physically sore. What do you do about it? By adding accessories like the Spartan Stress Pads, you can help reduce the localized vibrations in the hands and arms. This upgrade is available on all Spartan RT models and SRT Pro and HD. It comes standard on the Spartan SRT XD. 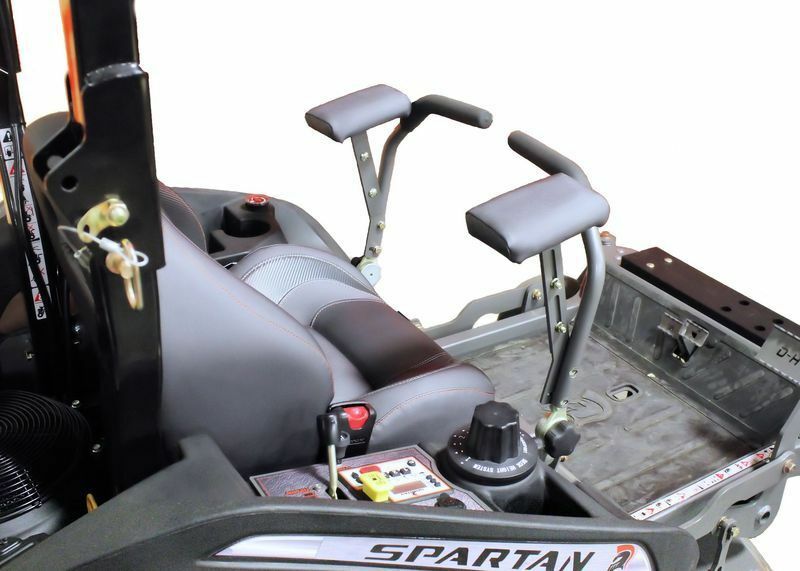 All Spartan Mowers come standard with an ergonomic cockpit to provide you with the smoothest and easiest ride. 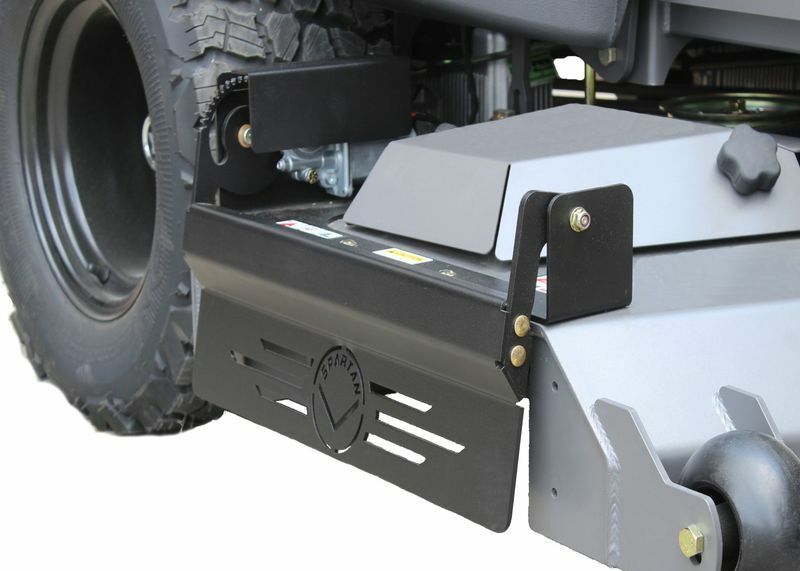 In fact, our 2018 models have a Vibration Control Deck System. However, our customers wanted more options in the seat department. You spoke and we listened. Now, you can upgrade your seat to the Spartan 360 Floating Seat System. For our 2018 models, this seat comes standard on the RT-HD and all SRT models. For more information about the Spartan 360 Floating Seat System, visit a Spartan Dealer near you. There is so much you can do to customize your zero-turn Spartan Mower for your comfort and for your mowing needs. Whether you need a solid steel sprayer tray, a striping kit to make your neighbors envy the clean lines in your lawn, or a canopy to keep the harsh sun at bay, Spartan Mowers has just what you need and more. Check out the MOWER ACCESSORIES section to see what accessories might make mowing your lawn more of a retreat and less of a chore. Don’t have a Spartan Mower? No problem. Our website is packed with information and specs on each of our mowers. You can compare different models side by side. You can even build your own Spartan Mower. This particular feature allows you to choose every aspect of your mower from the model to the motor to the accessories. You can send your custom build to your nearest Spartan Dealer or take it in when you go visit in person. It’s a great way to show your Spartan Dealer exactly what you are looking to buy.